Though social media spending is projected to constitute a growing share of companies' overall marketing budgets over the next 12 months, CMOs say, integrating social marketing into their overall strategies is still a challenge, according to a survey conducted by Duke University and the American Marketing Association. Social media spending is expected to account for 9.8% of marketing budgets over the next 12 months, up from the current 5.6%. Moreover, in the next five years, social spending is projected to climb to 18.1% of total marketing budgets. 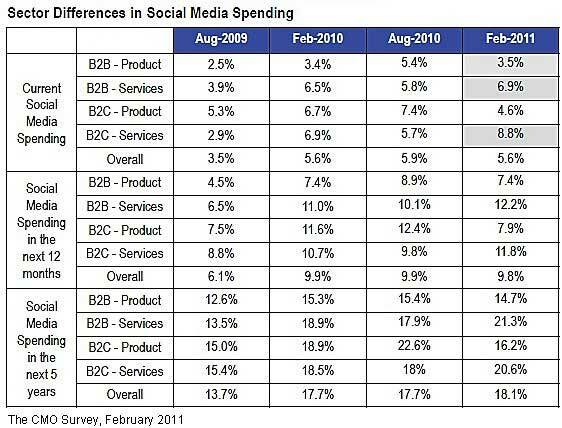 B2B services companies are expected to increase their social spending to 12.2% of total budgets, from 6.9%. B2C services companies are increasing spending to 11.8% of budgets, from 8.8%.